The Mas of "Grand Saint Julien", in the north of Apt near the village of Rustrel, is in the heart of an area of 40 acres of vineyards and grain fields. The old farm of the XVIII century was restored with care and taste. It lies in the midst of a shady park and invites you to be lazy at the edge of the swimming pool or on the large partially shaded terrace, with a wonderful view of the Provençal Colorado. Two bathrooms with bath and basin sinks and two shower rooms with shower and wash basin, fully faïencées. The house is equipped with electric water heater, a joint electricity and gas cooker with electric heating. During summer, natural air conditioning by the thick walls (60 cm). Living area = 200 sqm. Unfenced garden of 2000 m². Tourism and sports activities in the immediate vicinity (Hiking, biking, horseback riding, tennis, paragliding ...). The village is 2 Km Rustrel (Bakery, Grocery, newspapers). Apt and supermarket 7 km (farmers' market on Tuesdays and Thursdays, big market on Saturday). Avignon TGV station: 50 km International Marseille-Marignane Airport: 90 km. Vacances parfaites dans un gîte de grand confort. L'environnement est magnifique et les propriétaires charmants et discrets. Nous avons passé une très belle semaine en famille dans ce cadre exceptionnel, un dépaysement total! Les propriétaires sont charmants et très disponibles. Nous reviendrons avec plaisir !! Nous venons de passer une semaine parfaite dans le mas du Grand Saint Julien. Les propriétaires Bertrand et Brigitte Reynaud sont sympatiques et disponibles,leur maison est magnifique... et le lieu magique! Nous avons été conquis. Nous reviendrons! Available all the year for 4 to 12 persons. This property is located in the Natural Park of Luberon, 6 km from the town of Apt (15.000 hab.). 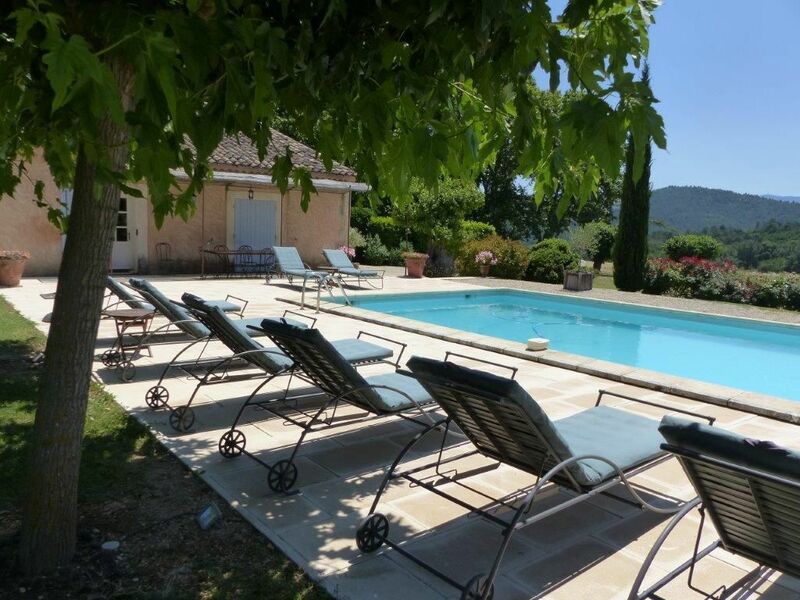 The Farmhouse, dating of more than 200 years will delight you with its remarkable panorama of the Colorado cliffs, the Luberon Mountains to the Mounts of Vaucluse. On the property of 40 hectares you will find vineyards, wheat fields and a large park with centennial plane trees and holm oaks. An exclusive view all around (360 degrees). A swimming pool (12 m x 6 m x 1,00 to 2,00 m of depth) just in front of the living and dining rooms with a great shaded terrace with table and chairs. (In service from the beginning of May till the end of October) Many garden furniture and barbecue. This residence (entirely renewed) is very luminous. It has the charm of the old provencal farm-houses. The various parts are roomy and very enlightened by many windows opening on the countryside. The space of living is 200 m2.